Cloisonne enamel ware is a metal working technique where a multi-colored glassy glaze is baked onto a metal surface and is similar to works developed before the Christian era in the ancient Mesopotamia and Egyptian cultures. Cloisonne is said to have traveled from Southeast Europe, to China via the Silk Road, and eventually to Japan. In English, this is called cloisonne enamel, but in Japanese it is known as "Shippo". "Shippo" means "Seven Treasures" and is taken from the Buddhist Sutra describing the beauty of seven kinds of treasure being spread out. 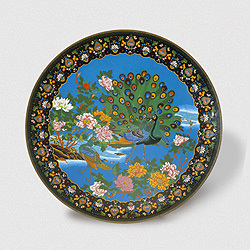 Cloisonne enamel ware first became internationally recognized in the mid 19th Century at the International exposition. Many artisans from Aichi, such as Kodenji Hayashi, received awards for their works, spreading the fame of Owari cloisonne enamel ware. Monument identifying the origin of "Shippo"